Boutros Boutros-Ghali (left), Secretary-General of the United Nations, and Klaus Schwab (middle), founder and president of the World Economic Forum, and Flavio Cotti, member of the Swiss Federal Council, at the 1995 World Economic Forum. 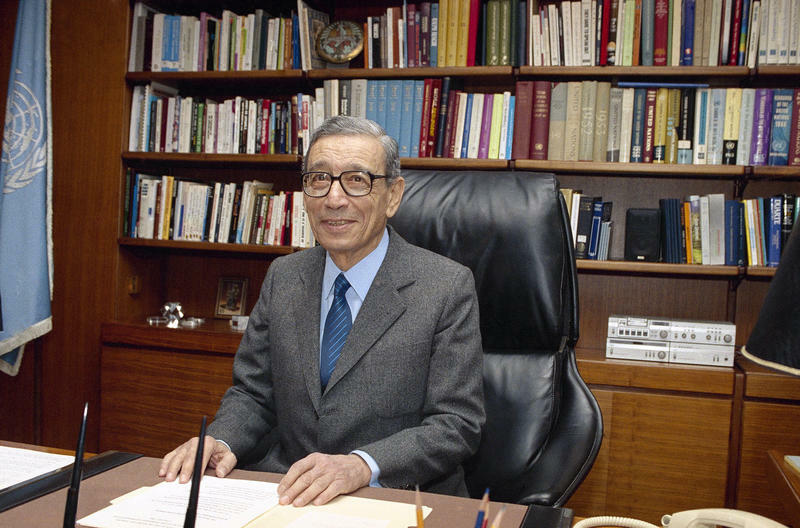 Boutros-Ghali, a Coptic Christian Egyptian who grew up in an upper class family and attended law school, was drawn to foreign affairs and believed the Middle East needed to pull itself up. Throughout his career he championed the interests of the developing world. His strong stance defending Arab interests brought tension with other nations. He often butted heads with the United States, particularly after becoming head of the United Nations in 1992. During meetings with Madeline Albright, the U.S. Ambassador to the UN at the time, Boutros-Ghali said he needed to be able to criticize America. Landis said that didn’t go over well. “He described it later as, 'When I said this, they both looked at me as if the fish dinner I had just served them stunk, and was rotten. ',” Landis said. His time at the helm of the United Nations was tumultuous. Boutros-Ghali faced the end of the Cold War and violence in Rwanda, Somalia and the Balkans. He received his share of criticism and some blamed him for the violence in Rwanda in the 1990s. Eventually, the United States blocked Boutros-Ghali from serving a second term as the head of the United Nations. The U.S. threw its support behind Kofi Annan, a fellow African, and Boutros-Ghali left office in 1996. Landis said the legacy of Boutros-Ghali lives through the causes he was most passionate about. “Throughout his life, his long life, he championed the Third World, and a better deal for the poor,” Landis said. His career ranged from teaching law in Egypt to attending the historic Camp David summit of 1978 and then to leading the world's pre-eminent international organization. Former U.N. Secretary-General Boutros Boutros-Ghali has died at age 93. The diplomat's death comes days after news emerged that he had been admitted to a hospital in Cairo — an event that prompted Egyptian President Abdel-Fattah el-Sissi to call Boutros-Ghali to check on his health.